Organizations use SharePoint to create websites. 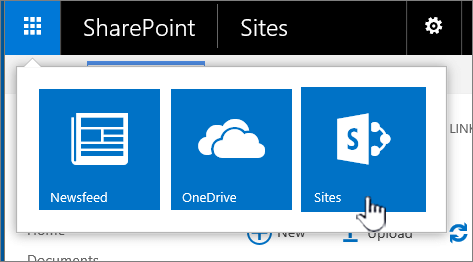 In Office 365, you can create a site from the SharePoint home page. You also get a SharePoint team site whenever you create an Office 365 group in Outlook Online or Office 365. If you're in SharePoint Server, you can create a team or a number of other types of sites. You can use the sites as a secure place to store, organize, share, and access information from any device. All you need is a web browser, such as Microsoft Edge, Internet Explorer, Google Chrome, or Mozilla Firefox. Get the SharePoint mobile app to stay connected from your mobile devices. You can drag files from your computer into your document library,. Click to open the document you want to work on and it will open in Office Online. 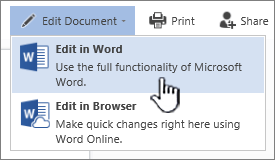 If you have the application installed on your computer and want to use it, click Edit Document > Edit in <application name>. For info on document libraries, see What is a document library? In a document library, click to open the document you want to work on. It will open in Office Online. The number of people currently editing the document appears at the top right of the document. Select the document you want to share, click the ellipses (…) to open the menu, and then click Share. 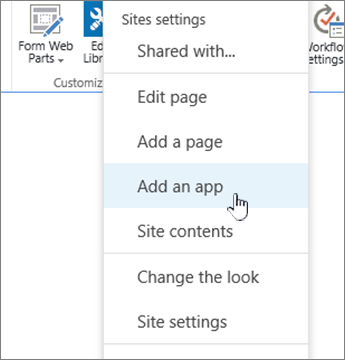 If you have site owner permissions, click SharePoint or Sites, choose the site you want to share, and then click Share . If you're using Office 365, you can create a site from the SharePoint home page, and it automatically creates an Office 365 group. If you create an Office 365 group in Outlook or People, and you automatically get a team site in SharePoint Online. For more on creating team sites, see Create a team site in SharePoint Online. 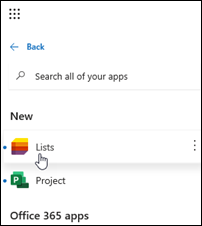 To add a list or library to SharePoint Online, click + New from within a site, and then pick List or Library from the list. 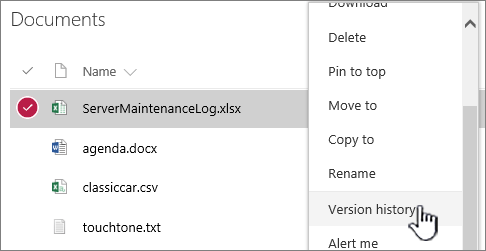 For SharePoint Server versions, click the ellipses (...) next to the file, and then click the ellipses (...) again in the dialog to get to the menu, or select the document and click Version History on the Files tab. Type a search keyword into the Search box, and then click the Search icon . See What's new in search in SharePoint Online. 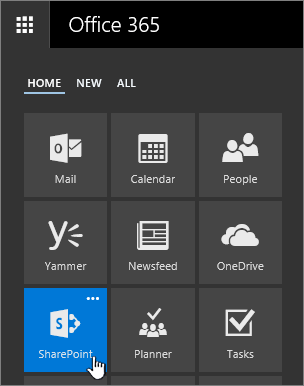 In Office 365, SharePoint Online, or SharePoint Server 2016, click the app launcher , then click the Yammer or Newsfeed tile, type your message, and then click Post. See Post something to everyone. There are several ways to copy or move files, depending on the version of SharePoint you're using. In SharePoint Online, you can use the Copy to or Move to command to copy or move files between libraries. For more info, see Move or copy a folder, file, or link in a document library. Getting your SharePoint library into an Explorer view can provide a fast way to do all file operations. You can do it essentially two ways, syncing the folders, or opening in Explorer. The difference is that synced folders persist and can be used anytime from any app, while Open in Explorer is a one-time operation. When you sync a library, you're making a local copy on your desktop machine. If you sync two libraries, you can copy or move files and folders, create folders, and delete one or more file or folder. Your synced library is automatically synced with the SharePoint library. 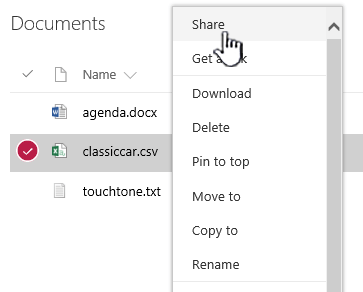 To sync libraries with SharePoint Online, see Sync files to your computer from a document library. For SharePoint Server 2016 or SharePoint Server 2013, see Set up your computer to sync SharePoint Server on-premises files. Another way to use Windows Explorer to manipulate files is to open a library in Explorer. Like synced folders, ths allows you to copy, move, and edit files and folders the way do on your desktop. 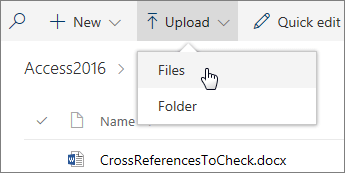 Files are automatically updated in your SharePoint library. For more info, see Ways to work with site library files in File Explorer. Want to control access to your stuff? 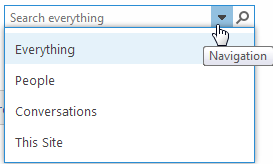 SharePoint is all about permissions. Get a better understanding of how permissions work, and you’ll understand how to control access to stuff on sites. Watch Video: Understanding permissions in SharePoint. Once you understand how permissions work, see how to do it in Edit and manage permissions for a SharePoint list or library. I've got OneDrive for Business. How do I decide whether to move them to SharePoint team sites? 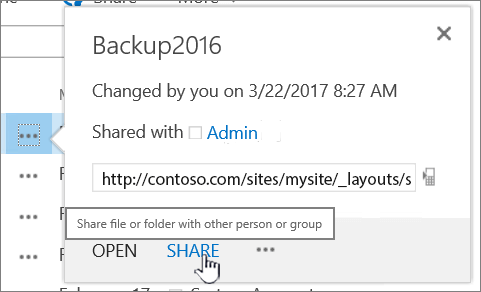 If you have OneDrive for Business and want to decide between that and SharePoint team sites for your documents, see Should I save my documents to OneDrive for Business or a team site?.